BRIDGEWATER, N.J. -- Republican Ohio Gov. John Kasich urged President Donald Trump on Sunday to stop the staff chaos at the White House and "settle it down." Strategist Steve Bannon last week became the latest top White House official to follow Trump's national-security adviser, a chief of staff, two communications directors, a press secretary, and others out the door. 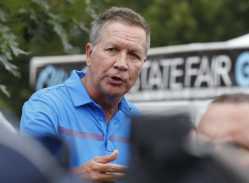 "You can't keep putting new people in the lineup and think you're going to win a world championship," said Kasich, who is among those who think the staff churn is hampering Trump's ability to notch a major legislative victory. He voiced his concerns on CNN's "State of the Union." The White House said Bannon and new White House chief of staff John Kelly had "mutually agreed" Friday would be Bannon's last day. Bannon immediately resumed his role as executive chairman of the conservative Breitbart News website, which he led before joining Trump campaign. David Bossie, a former deputy manager of Trump's campaign, said Bannon wanted to give Kelly "an opportunity to have a clean slate." Bannon repeatedly clashed with other top advisers, most notably Trump's son-in-law, Jared Kushner. He dismissed concerns that White House staff divisions are hurting Trump's ability to get his priorities passed, saying "in every presidency, there are factions." Bossie blamed Republican congressional leaders instead. "No one is saying the president is not leading. There's a lack of leadership on one side of Pennsylvania Avenue," he said on "Fox News Sunday." Rep. Adam Schiff of California, the top Democrat on the House intelligence committee, urged "more cleaning house" at the White House, echoing some fellow Democrats in naming policy adviser Stephen Miller and national-security aide Sebastian Gorka as two who should be fired. "There certainly are a lot of people on the White House staff and NSC staff that shouldn't be there, people like Miller and Gorka and others, who not only, I think, represent the same thing that Steve Bannon did, but also aren't capable of doing the job well," Schiff said, also on CNN. "So, yes, I think there's more cleaning house that ought to take place," Schiff added. Schiff also questioned Trump's capability. "There's some attribute of his character that makes him seemingly incapable of introspection and a broad understanding of what the country really needs. And I think it's a question that people are asking, you know, what is going on with this president?" The lawmakers and others spoke Sunday as Trump prepared to return to the White House after more than two weeks away. Trump spent most of what he said was a "working vacation" holed up at his private golf club in central New Jersey. He also spent two nights at his home at Trump Tower, his first visit to the New York skyscraper since taking office. Before Trump departed New Jersey, the White House announced that Trump planned to address the nation Monday night from Fort Myer in Arlington, Virginia, on U.S. policy toward Afghanistan and South Asia. Trump and his national security team met at the Camp David presidential retreat in Maryland on Friday to hash out policy toward South Asia. Defense Secretary Jim Mattis, traveling in Afghanistan, said Sunday that the president has agreed on a new war strategy after 16 years of conflict, but declined to discuss details before Trump announces his decision. Trump's upcoming week also includes travel to Arizona to visit a Marine Corps facility in Yuma and hold a campaign rally in Phoenix on Tuesday. He stops in Reno, Nevada, on Wednesday to address the American Legion convention. Back in their states and districts for the August recess, Republican lawmakers were scarce on Sunday's talk shows, skipping opportunities to weigh in on the president's comments about the violence in Charlottesville, Virginia, and Bannon's exit from the White House. An exception was Sen. Tim Scott, who urged Trump to spend time with people who have lived through the nation's difficult racial past. The South Carolina Republican had said last week that Trump had compromised his moral authority by appearing to equate neo-Nazis and white supremacists with those who came out to oppose them in Charlottesville. Trump said there were "very fine people, on both sides" of the clashes. Scott said the nation is in a "very critical and sensitive time" and that Trump's next steps would speak louder than his words. "Without that personal connection to the painful past, it will be hard for him to regain that moral authority, from my perspective," Scott said on CBS's "Face the Nation."